It was evening as me and the lads sailed near the coasts. There were no arguments today and no mystery over where we would grab grub at. This place was me ol' favorite and the lads loved it too. The entire crew had unanimously voted Pizza for dinner. As the sun set in the horizon and the sky was painted with mellow orange hues, the appearance of seagulls signaled the approaching coast. We anchored neared a cliff and a rather large landing party headed out. Landing party or shall I call it a Pizza Party. After the Earth and the iris of a shiny eyed lady, a pizza is perhaps the most beautiful circular object I can think of. 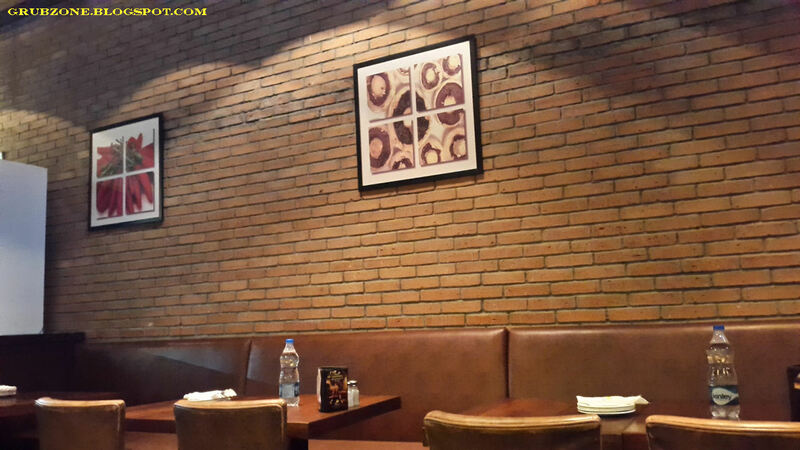 I love pizza places, parlors, restaurants and whatever pizza installations one can think of. 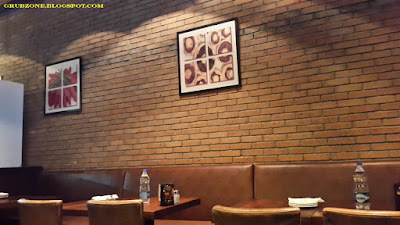 And at the time of writing of this post, California Pizza Kitchen(CPK) is my favorite Pizza place in India by far. I have been here only a few times so I cannot call myself a regular just yet but I don't see why I won't mind being a regular. The restaurant has a lovely ambiance which seems to combine themes from an Italiano Pizzeria and an Americano Californian Pizza parlor. It radiates a comforting vibrance. The bricked appearance looks amazing at night under lights. 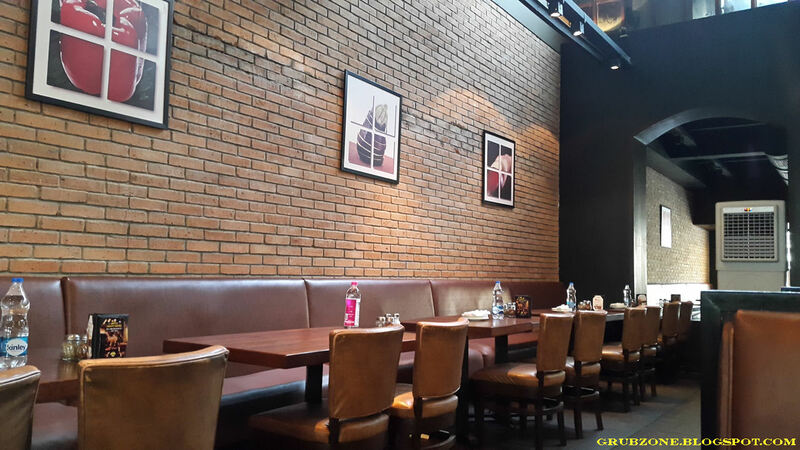 There are two visible halves to the restaurant and the first half appears brighter as opposed to half near the windows which appears dim. 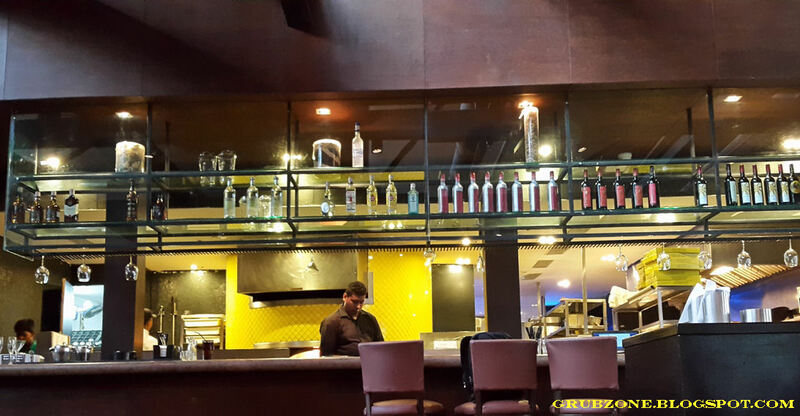 Depending on how you like your setting during dinner, you can choose your favorite half. A pizza party, a family celebration or a friend's night out works better in the first half. A romantic date is better suited in the second half. The goods are baked in a wood fired oven just like traditional pizza. 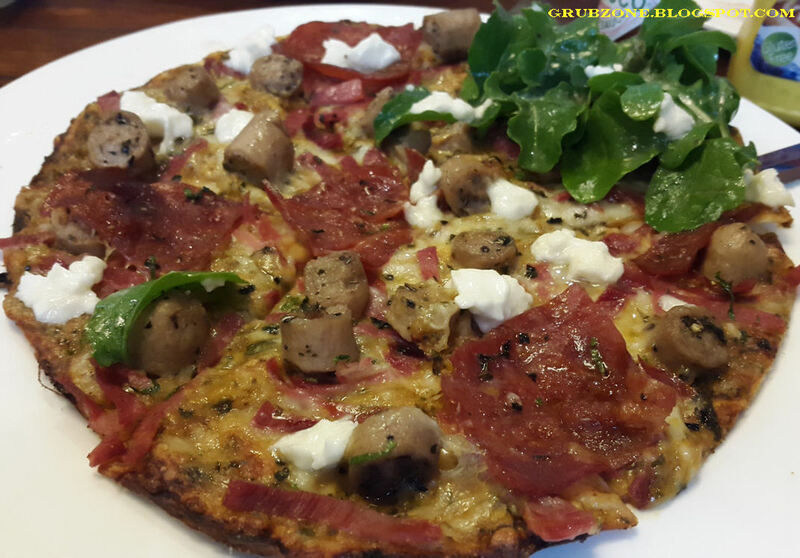 There is a remarkable difference between Microwaved pizzas and Wood oven pizzas. While microwaves are more efficient and uniform with heating, the wood oven imparts a certain imperfection that actually makes the pizza more flavorsome and traditional. Sometimes, traditional methods provide the flavor that is often lost by technological advances. 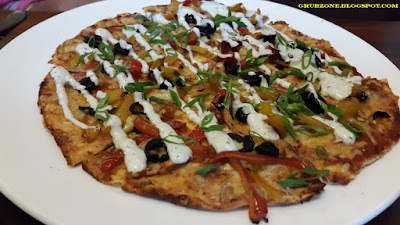 All pizzas are made on a thin base which is slimmer than the doughy monstrosities you find at mass market pizza outlets and thicker than wafer thin bases which makes one wonder if this was pizza at all. CPK makes Gourmet pizzas which employ a mix of Californian cuisine and New York style pizzas. The results are absolutely addicting and superior pizzas. 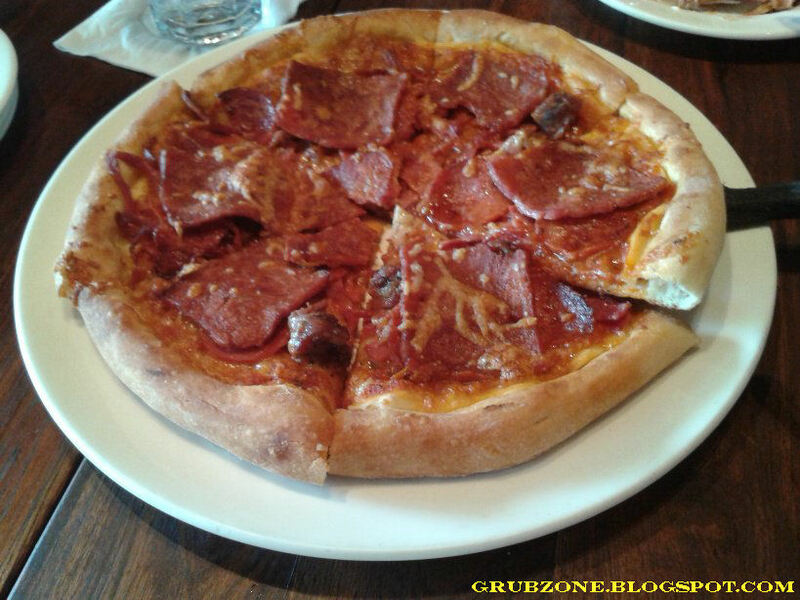 Meat Cravers Pizza was the first pizza that I tried at CPK. Loaded with Salami, Pepperoni, Canadian Bacon, Italian Sausages and Capicola ham - This is one pizza that will always be a safe bet for a carnivore. The texture is reddish due to the meat and the veg content is understandably low. Each bite fills the mouth with natural saltiness and savory resulting from different kinds of meat. The added Mediterranean spices play a bit of magic as well. Captain : Now this is how I like me pizzas. All meaty and no greens to spoil the show. First mate : Great to hear it mate, now if you dont mind - Stop hogging it all alone. Captain : Can't let yer old Captain have one extra slice? First Mate : You can't push me around like your other mates, buddy. 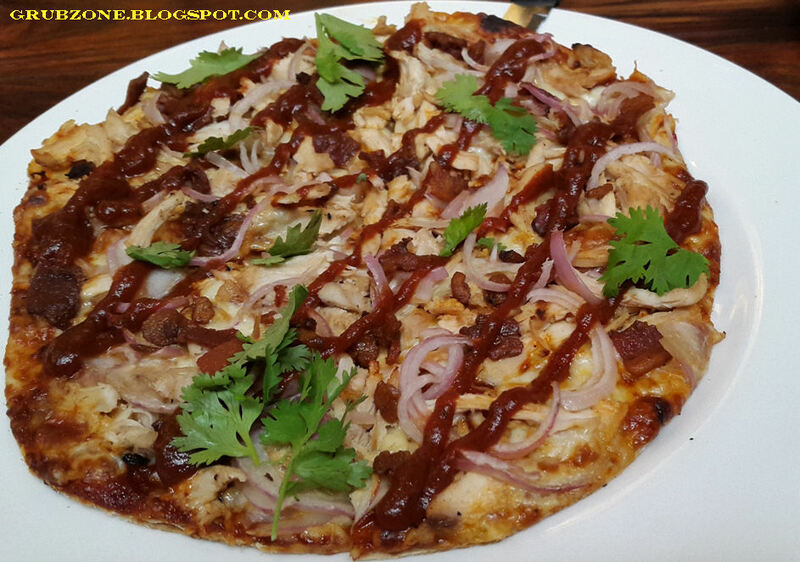 Barbecue Chicken is one of my favorite pizzas and CPKs version is perhaps one of the best variant that I have had. Gouda and Red onions form the first layer as BBQ sauce and chicken form the dominant flavor. The Bacon add-on takes the flavor to the next level. The only thing that has no need in this pizza is the addition of the aesthetic greens. This pizza is salty and reminiscent of the classical pizza experience. 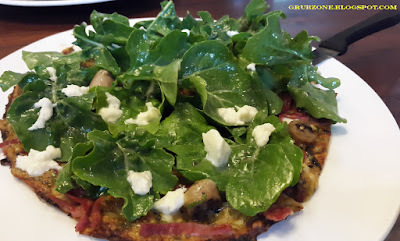 Deli Style Bistro Pizza was perhaps overdone with the addition of Arugula(Rocket) leaves. A meaty pizza should not look like this. After I pizzaformed the green landscape, the pizza looked more authentic and meaty. I also had to manually transfer the Bocconcini cheese to the pizza layer below. Its a tiring but a rewarding task. This pizza was loaded with Italian sausage, Capicola ham and bacon. The base had been painted a bit with pesto but the flavor of pesto was mostly drowned in the meaty goodness of the pie. The spice mix used here was different than the one used in the Meat Cravers and I positively found the taste of this pie far superior than that of the meat cravers. Just that the greens can initially come off as some kind of a cultural shock. Captain : The pizza was almost like digging a treasure out of the Green monstrosities. First mate : Get a room you two. 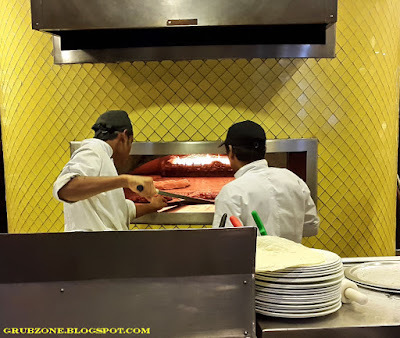 Alfredo Pizza - Despite having a lot of vegetarian options on the menu, CPK may not be ideal place for the vegetarian pizza lover. But this pizza does come close to being "suitable". Its a simple construction with a herbed base and an addition of scallions, bell peppers, olives, tomatoes. The flavor however comes majorly from the artistic spray of the creamy Alfredo sauce. This is the only part that irks me. One ingredient should never speak for the entire dish. Because that makes me ponder whether I truly liked the pizza or was it just the Alfredo sauce. If one gets tired of pizzas, there are always other options. 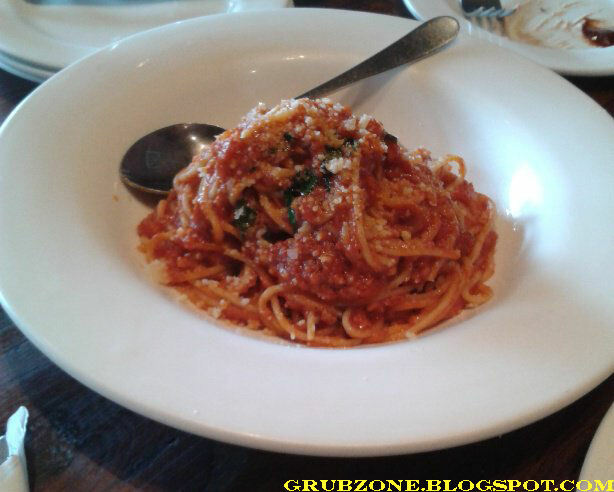 Tomato Basil Spaghettini is a mixture of Spaghetti garnished in Parmesan, Italian tomato puree, Basil, garlic and spices. It has a rough appearance due to the addition of Parmesan and spices but the flavor is quite strong and it has a tangy savory flavor to it. The portion size however may feel a bit scroogey. 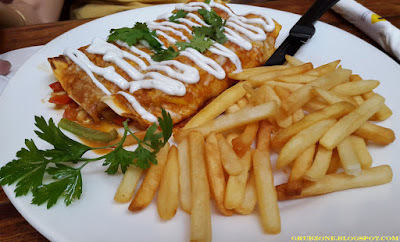 Roasted Enchiladas are one of the best options for the vegetarian patron. The plating is amazing and the rolls wear a non traditional flattened appearance. These are even added with an artistic drizzle of cream sauce and come with a portion of fries. The mashing within is made of potatoes, spices, tomatoes and cheese. The flavor is quite tantalizing even for a meat eating palate and the portion size is quite generous. 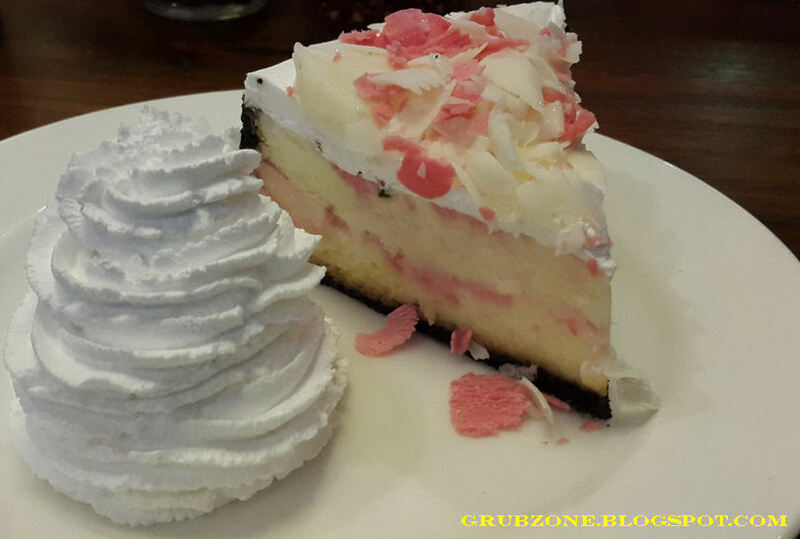 White Chocolate and Strawberry cheesecake is a pleasing preparation for most. However, I must make note that this item has been changed from it used to be. Earlier it was a true baked cream cheesecake with the traditional flavor of cheesecake. As of now the flavor is dominated by white chocolate chips and I can't help but feel that the flavor feels close to an eggless cheesecake with perhaps something else used instead of Cream cheese. 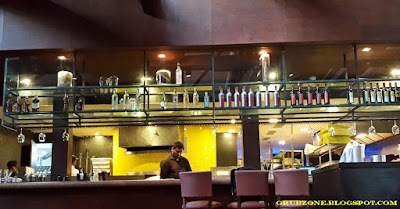 At INR 475, I would rather find more authentic options elsewhere. Captain : This is delicious. Crewmate : Somehow, I don't believe that cappy. Captain : Hmm, how can you tell ? The pricing is on the higher side and resembles a fine dine. But the pizzas are mostly worth it. I have not found a cheaper place which can offer me a similar experience. To wrap this up, I'll shall only say that I will keep visiting this place many more times in the future. The pizzas are too good. "I see that you lads look filled and lively. After all, Pizza is God's own food. Now with your renewed vigor, its time to head out and tame the wild seas again."